How Can I Hear My Angels and Guides Messages ? our angels and guides messages. We just forgot how to! In teaching classes on the many ways to get deeper connected in hearing our guides and angels I always begin from the begiinig. We are just re-remembering how to speak to and listen to what spirit wants us to know. Speaking to our angelsaguides is Not something new to any of us. It is just a forgotten art. We have gotten so stuck in day to day living that we have forgotten what is the most natural part of who we are; spirit. One of the easiest ways to get closer to your spirit is by doing things , simple things each day that you enjoy. Light candles and scents that you love to smell. Listen to music and sing and dance. savor the taste of delicious foods. Listen to the birds. Look at the sky, the trees, the blades of grass. Laugh a lot. laughter releases serotonin in your brain. Serotonin brings you closer to sprit.Touch something soft. Feel the water on your face. Breathe in the scent of the a cool breeze . savor everything and every one. this will bring you closer to spirit., The closer you get to spirit the easier you can hear them through your heart. deep breath The easiest and most effective tool to get closer to spirit is breath. breath IS spirit. When you take a deep breath in it should come from your stomach. Shallow breathing from your chest will not bring you to the euphoric state or alpha state need to connect stronger to spirit.The best part of deep breathing is it doesn't cost a cent. One of the most effective ways to hear your guides is through journaling. Some people teach to use your less dominant hand. I don't think that is necessarily necessary but if it works for you use it. Find a quiet place. Preferably out in nature at least in the beginning while learning to speak to spirit. Once you are easily able to go straight into it you can do this anywhere.Again take deep clearing breaths. You can start with a prayer asking for your highest if you'd like. Ask a question, any question. 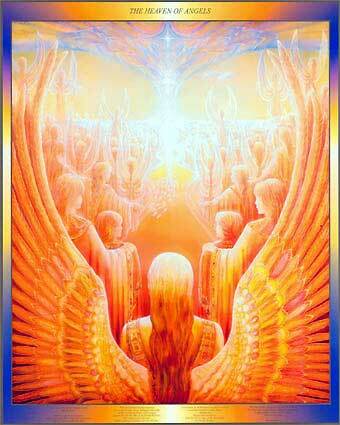 You can ask your angels and guides who they are and what did they come here to show you. Ask any question your heart desires to know in the moment. take a deep breath and just write write write. Do not stop to read what you wrote until you are completely finished with whatever you wrote. Take some time to breathe, drink water and just process all the information afterwards. Two things will happen to show you that you were connected. 1- You will notice your handwriting is different. That is because on a certain level the information you were writing wasn't coming from you. It was coming Through you from your angels and guides. 2- You most likely will not remember what you wrote. That is because once you breathe into another state , an alpha state you are in a trance like place. Part of you in some ways is not really here per say any more.